Full disclosure: I am a Banza Pasta RD Ambassador and this post is in relation to their January contest to #ResolveToEatMorePasta. I was given coupons + free product to make recipes, but the recipe and thoughts are all my own! It is officially winter (it was 15 degrees yesterday) and all I want is warm comforting food. 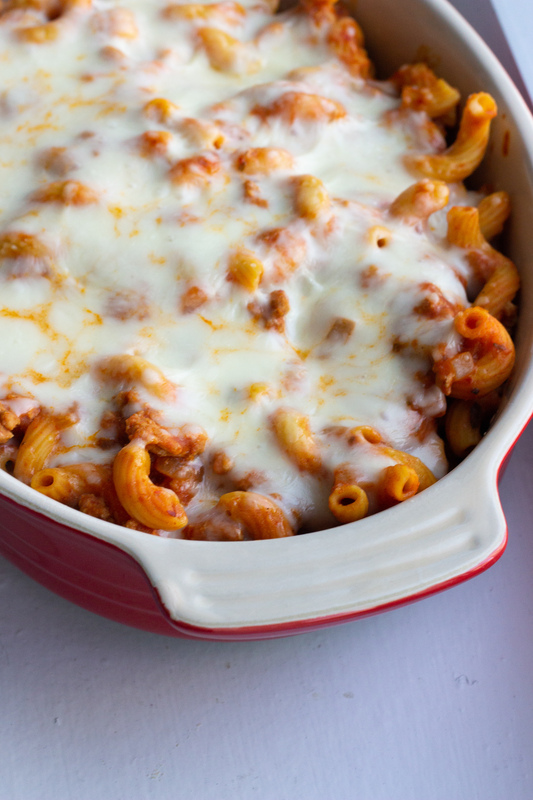 And nothing says comfort food more than a bubbly casserole of pasta + meat + cheese. 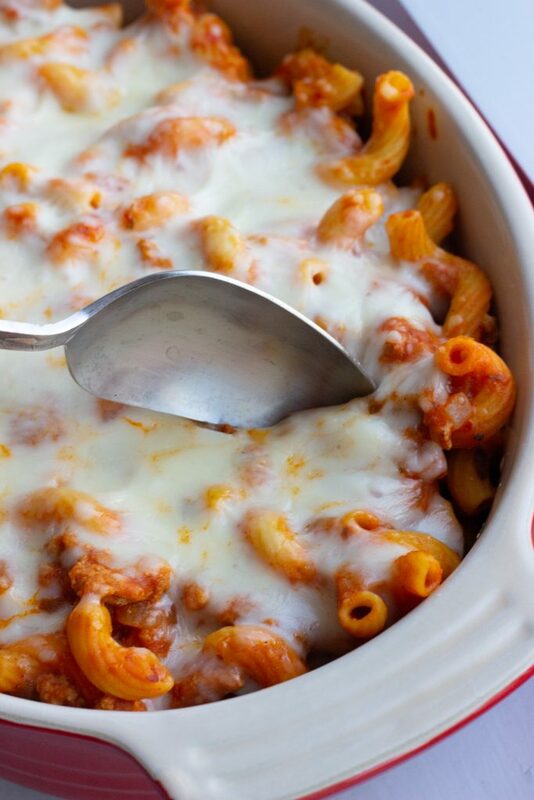 AKA this Banza Pasta Faux Lasagna. It is my traditional Faux Lasagna with a twist – instead of regular pasta noodles, I used Banza Cavatappi which increased the protein + fiber content of this dish. As a dietitian, I love ways to add extra fiber into dishes that my family loves! Plus, since the chickpea pasta cooks up very tender in a short amount of time, the whole casserole bakes up super quick. Which means that I can get dinner on the table ASAP. And leftovers heat up perfectly in the oven or in the microwave (because #NoSadDeskLunch here!). What I also love about the recipe is that it has a pretty easy ingredient list. 1 jar good quality marinara sauce. 1 pound grated mozzarella cheese (by the block and grate it yourself, please!). Since Banza pasta comes in 8oz boxes (AKA half a pound), you can make the full recipe and either save half the sauce for later or make two boxes of pasta. Your choice! The sauce is my go-to meat sauce for everything – I put it on pasta, use it as a pizza topping (!! ), and as the filling for faux lasagna. I have even just eaten it with a spoon out of the skillet… it’s the best and a true “workhorse” recipe. And it comes together in one skillet. In a large high-sided skillet, add some olive oil. When the oil is hot, add in the diced onion and cook until fragrant. Add in some garlic and cook until fragrant. When the aromatics are soft and golden, add in the ground meat. I love either beef and turkey in Faux Lasagna – this time I used 93% lean ground turkey! Cook the turkey until completely brown. Remove from the heat and drain the whole onion/meat mixture to remove any excess grease. Return the meat mixture to the skillet and turn the heat back on to medium. Season the meat mixture with salt, pepper, dried oregano, and red pepper flakes (because a little spice is always nice). Pour over a whole jar of good-quality marinara sauce. Give everything a stir and assess the liquid level – the pasta is going to absorb a bit of the moisture from the sauce, so it should be a little on the loose side. Add a little broth or water if needed. Allow the meat sauce to simmer for about 15 minutes – which is the perfect time to bring a huge pot of water to a boil and cook any short Banza pasta shape (I am in love with the Cavatappi shape) for about 5-6 minutes. The pasta should still be slightly firm because it’s going to finish up in the oven. Drain the pasta and pour into a bowl. Add in half of the sauce (if only using one box of pasta). Toss to coat, adding a little extra marinara sauce if it looks a tad dry. Add in 4oz of grated mozzarella cheese and stir to combine. 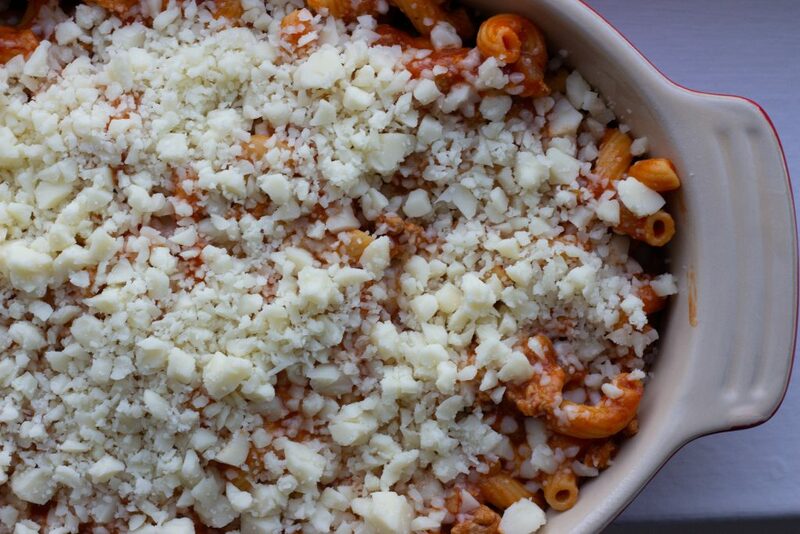 Pour the pasta-sauce-cheese mixture into a greased baking dish – this is 7×11 inch (1.75 quart) baking dish… but this would bake up great in a 9×9 inch square pan too! Sprinkle over another 4oz of grated mozzarella and then pop the Faux Lasagna into a preheated 350 degree oven for about 10-12 minutes, or until the top is bubbly and golden. If you’re looking for a slightly charred top, pop the whole casserole under the broiler for a minute or two! If that isn’t a dinner winner, I don’t know what is? This recipe is a double duty recipe - it makes double the amount of sauce needed, so you have another dinner waiting in the wings! In a large, high-sided skillet, heat olive oil over medium heat. Add in onions and cook for 2-3 minutes until soft and translucent. Add in the garlic and cook for 30-60 seconds until fragrant. When the meat is cooked, drain the meat/onion mixture in a colander (in the sink!) to remove excess grease. Pour the meat mixture back into the original skillet that is set over medium-low heat. Pour in the marinara sauce and add the salt, pepper, dried oregano, and red pepper flakes. Stir thoroughly to combine. If the sauce looks "dry", add in some additional sauce/broth/water. Cover and simmer sauce over medium-low heat for 15 minutes. When the sauce is done simmering, taste and adjust for seasoning (salt + pepper + red hot chili flake). Remove half the sauce from the skillet and save for a later date (I freeze it for later!). If the sauce is done simmering before the pasta is ready, turn off the heat and keep covered until needed. Bring a large pot of water to a boil. When the water is boiling, add salt and one box of Banza pasta - cook for 5-6 minutes until very al dente. Drain pasta and add to the meat sauce. Stir to thoroughly combine. Add in half the grated mozzarella cheese to the pasta/meat mixture and stir to combine. Pour the mixture into a greased 7"x11" or 9"x9"pan. Top with the other half of the mozzarella cheese. Pop the pan into a preheated 350 degree oven and bake for 10-12 uncovered until the cheese is golden and bubbly. Let the faux lasagna sit for 5-10 minutes before serving. Enjoy!